Do your feet need some TLC? Try this Skin Republic Foot Repair Mask. 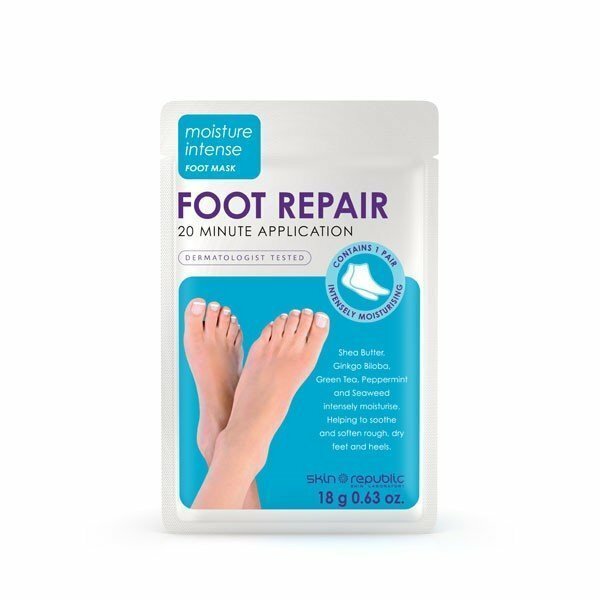 Rich in dry extracts of Gingko Biloba, Green Tea, Peppermint, Seaweed and Shea Butter - this deeply penetrating formula helps soothe repair and soften rough, dry, chapped feet and cracked heels. Each pack contains one pair of foot masks. Shea butter has the ability to soothe, hydrate and balance the skin. It is used as a moisturiser for dry skin and helps repair and soothe cracked heels. Shea butter aids in the skins natural collagen production and contain oleic, stearic, palmitic and linolenic acids that protect and nourish the skin to prevent drying. Green tea extract is naturally rick in antioxidants, which help protect the body from free radicals. It has also been shown that green tea has the ability to rejuvenate old skin cells that are at the end of thie life cycle, with the added benefit of having anti-inflammatory properties. 2. Remove booties from packaging, tear open along perforated edge and place feet inside booties. 4. Remove booties, no need to rinse feet.